This piece was originally published on CODO’s blog. Check it out to see the rest of the 2018 beer branding trends as well as dozens of others behind-the-scenes looks at brewery branding projects. Craft beer in 2018 is off to a fun start: 6,000+ breweries, major trademark infringement lawsuits, more acquisitions and closings, more mixed culture beer, glitter beer(?) and the continued craze that is hazy-juicy-milkshaky-New Englandy IPAs. Along with a host of new branding trends, there are several major currents that are impacting the industry and driving these aesthetics themselves. Lager, cannabis, Walmart, the word “craft” — we have a lot to discuss. Let’s dive in. Color has always been an easy way to differentiate between SKUs. And it makes a lot of sense for breweries with a strong flagship program and off-premise focus — combine a cool, minimal look with punchy colors for a clean look that stands out from louder, busier packaging in the cooler. Early players in this space were Rhinegeist, Fernson Brewing and Austin Beerworks. But over the last four or five years, this look has become so ubiquitous that it’s all starting to run together on shelf. Color differentiation: 1. Big Bend Brewing by Guerilla Suit, 2. Hellbender Brewing by Pig Iron, 3. Monument City Brewing by Orange Element, 4. New Sarum Brewing by Big Bridge, 5. Fernson Brewing by CODO Design. This can be arrestingly gorgeous or a busy mess. The outcome is driven by the illustrator, creative firm, and of course, the brewery itself. This style can be a bit overwhelming on its own, but in a sea of stark, ultra-minimal packaging, it’s starting to stand out more and more. Dense and illustrated: 1. Breckenridge Brewing by VSA Partners, 2. Big Axe Brewing by Hip Street, 3. Prodigy Brewing by CODO Design, 4. Indeed Brewing by Duffy & Partners, 5. Bayou Teche Brewing by TILT. Is it store brand or premium? Is it Millennial Minimal or just unconsidered? Maybe vintage and unfettered? We touched on the minimal branding trend last year. And while it was definitely clean, there was still some color to it. Now, we’re seeing packaging (predominantly cans) that eschews even the most base of design elements altogether. This may be the minimalist design trend end game, and it remains to be seen if it’s effective on shelf. Bright white: 1. Be Right Beer Co. by CODO Design, 2. House Beer by Colony, 3. Anderson Craft Ales by Brett Lair, 4. Agder Bryggeri by FRANK. Traditional, direct-to-can printing has been a big reason for the pervasive minimal design trends we’ve already touched on. Each color costs money (plates, ink, setup fees, proofing, etc.) and you can run into production issues if your design is too complex or finely detailed. But with the rise of digitally-printed sleeves and pressure sensitive labels, more breweries are embracing full raster photos (an image composed of pixels, versus an infinitely scalable and simpler vector graphic) in their packaging. 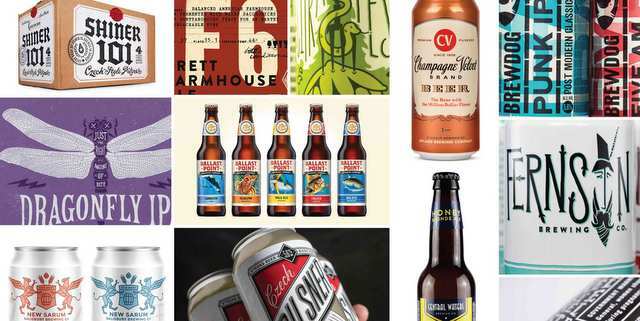 Whether full color photos, stripped down to mono or duotone, or even as a halftone treatment, this is a refreshing new look from the simpler aesthetics that have defined craft beer branding over the last several years. Photos and raster: 1. Bluejacket, 2. Voss Fellesbryggeri by Creuna, 3. Northbound Brewing by PaperJam, 4. Fieldwork Brewing by Gamut, 5. Chérie by ATIPUS. Murdered out: 1. Beer Brothers by BramCreates, 2. WarPigs Brewing by Zimmer Design, 3. Lord Hobo Brewing by Ben Whitla, 4. And Union by And Union, 5. Carlsberg by Kontrapunkt. We first touched on this visual trend in 2016 and it hasn’t lost momentum since. Vintage aesthetics are persistent in branding, largely due to the warm blanket that nostalgia offers. By idealizing the past, breweries harken to “a better time” — back before cell phones ruled our lives, and before the 24-hour news cycle filled us with a pervasive sense of dread. Reality be damned; at one point we’ve all been caught assuming that the past was just a little bit better than, ugh, now. Lately, (and perhaps as a play toward capital-A Authenticity) we’ve noticed a rise in more expressive, ornamental — and in some cases, downright strange — visuals, straight out of the 1960s and ‘70s. The character and personality of this movement stands in stark contrast to the clean-cut American industrial lexicon of the 40s/50s invoked ubiquitously within the craft brewing industry. Throwbacks: 1. Big Lug by CODO Design, 2. Chattanooga Brewing by Widgets & Stone, 3. Strap Tank Brewery by Helms Workshop, 4. Sycamore Brewing by Shepherd. One of this year’s most ironic trends is craft beer’s embrace of low alcohol lagers. Not beautifully-made German lagers, but the infamous “yellow fizzy” domestic light lagers against which the craft beer pioneers of the past 20 years have positioned themselves. Perhaps driven by a broader industry trend of imported Mexican lagers selling like wild fire, these beers clock in around 4-ish percent ABV and often at bargain basement pricing. Folks, major craft breweries and upstarts alike are now making honest-to-god domestic light lagers. What a time to be alive. Flagships are dead, long live flagships: Too big to fail? Brew a milkshake IPA. We craft beer drinkers are a fickle and promiscuous bunch. Our endless search for the next new thing has started to impact large craft brewery flagship sales (with 15 of the top 30 craft breweries in the United States seeing sagging flagships sales over the last few years). Many of these upper echelon breweries are shuffling their portfolios, retiring weaker performing brands, releasing line extensions, and jumping full bore into major trends, namely, NEIPAs and IPAs (think Hazy Little Thing, Rebel Rouser and Voodoo Ranger Juicy Haze IPA). And many smaller breweries have adapted by endlessly brewing special-release beers (usually a rotating IPA, almost always in egregiously-priced 16-oz four-packs). One could argue that this approach is, as a whole, is the new flagship. Shaping your brewery’s brand voice: How to communicate your values with words. Click these words! And if you look at CDC reports, you see that underage drinking is at a record low. This is, of course, a good thing. But if you dig deeper into the findings, you’ll see that cannabis consumption is on the rise amongst these same kids (it’s like a fun, inebriation shell game!). As someone who works in both cannabis and craft beer branding, I remain completely nonpartisan on this issue, but back to my theory for a moment—if beer (cheap or otherwise) is a small part of teenagers’ lives today, then I bet it will continue to be a small part of their lives as they mature and have more buying power. Let’s check where the craft beer industry is in 10 years to see if I’m right. If I’m not, I’ll buy you a (hopefully) 100 percent legal joint. Or a beer. Your call. We’ve seen this exact concept flourish over the last few years. Interestingly, it’s starting to effect local bar and restaurant business. I love drinking in brewery taprooms — and so do millions of people across the United States. And this new competition is creating a strained relationship between breweries and the craft beer bars that helped to build up these brewery’s brands in the first place. Let’s learn about environmental design: Turn your brewery into an immersive brand experience. Perhaps the most threatening trend we’re seeing today is big box store brands introducing their own private label “craft” beer brands. Think Costco, Walgreens, Walmart and even regional liquor stores (which is an interesting blurring of the 3-tier system, but that’s none of my business). We’ve written about “kraft” beer before and won’t rehash the ethical implications of fibbing and/or outright lying to consumers. A more imminent issue is the volume pricing these corporations can leverage against smaller, independently-owned craft breweries competing in the same aisle (see aforementioned Lager for Days trend). This column was provided by the folks at CODO Design, a branding firm based in Indianapolis, Ind. They’ve worked with breweries across the United States and around the world, on naming, branding and positioning, rebranding, responsive web design, and package design. They’ve gathered their experience into a comprehensive Craft Beer Branding Guide to help startup breweries navigate the entire branding process. Check it out at www.craftbeerbrandingguide.com.